Katie and I do a lot of camping. Last year alone we camped probably a dozen times throughout Shenandoah National Park and George Washington National Forest. We really love our little escapes to the mountains from the city. It not only refreshes the mind, but also the body and spirit. 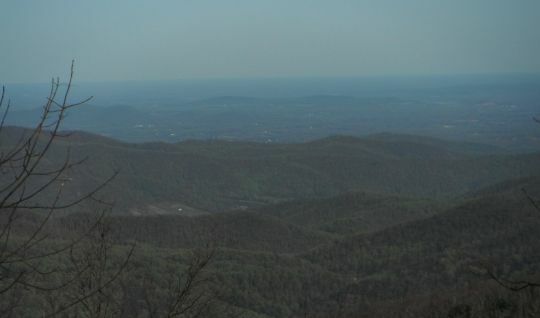 So naturally, as I plan for the next big thing with my running, The North Face Endurance 50 Mile (DC), I decided a weekend out to Shenandoah to refresh and jump start the mind and the body was a good thing to do. The past several months of running were a build up to the Rock n Roll Marathon a few weeks ago. The plan was to train with that in mind, and just shift from there to train for the 50. The two weeks following the marathon, I cut back on running a bit to give my legs a bit of a break, with the plan to really get things started with a weekend out in the woods. The plan was to go up early Friday afternoon and spend two nights camping and two days running. I decided to do this one solo so that I could really focus on wrapping my head around the upcoming 50 miles, and well life in general. Plus I knew that if Katie was with me I’d much rather spend my time sitting around the fire with her than off running by myself. So come last Friday morning, she packed her bags for a girls weekend in New York, and I loaded the car with a tent and cooler, kissed Katie goodbye, and went off into the woods. Now let’s be real, unless it is December and snowing out (which we have done a few times now) you are rarely alone in Shenandoah National Park. With well over 1 million visitors each year, it ranks within the top 20 most visited national parks in America. But on an early April weekend with cool temperatures and high winds, crowds were pretty low. I grabbed a nice campsite at Lewis Mountain Campground, the smallest in the park, and set up tent. Turns out I got a little excited about the camping side and lost track of time on Friday. After setting everything up, gathering some firewood, and wandering around a bit, the day flew by and it was already 3:30 before I laced up the trusty MT101s for a run. While the wind made standing still a bit chilly, I kept to shorts and a long sleeve T for warmth. I filled the Nathan vest with water and a few other snacks (more on that to come in a future post on Gu alternatives) and headed down to the Bear Church Rock trail head for an 11.5 mile loop. I chose this loop for a few reasons. The first was that I knew I’d be spending most of my time on the AT Saturday and wanted something different, and secondly because it was right at the perfect distance for me. On top of the miles, the 11.5 mile loop housed nearly 2,400 feet of elevation gain, and let me tell ya…if you were to add up all the hills in Rock Creek Park, I bet it would come no where near 2,400 feet of gain. The run started out great. I took off for about .4 miles on the AT with a climb right out of the gate. I was feeling excited, so moved swiftly up that section of trail and got into a good rhythm as I dropped down along a series of other side trails to Bear Church Rock. Things were feeling great when I paused at an overlook around mile 5 to take in the view. It was around here that I saw the only other people out on the trail that afternoon, two backpackers about to set up camp for the night. 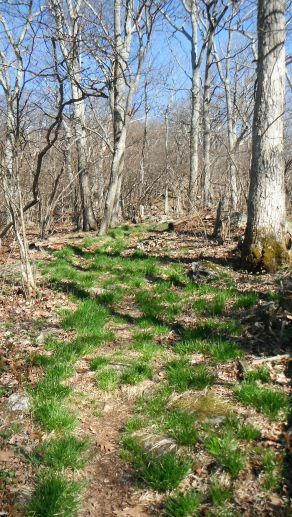 Soon after that the trail dropped significantly into the ridge along a creek. The further I dropped, the more I noticed that the sun was setting fast on the other side of the ridge. It was still early, and I knew if all went well I’d have plenty of time, but I wasn’t totally sure when the sun would set and really didn’t want to find out alone on the trail. It was also right then that I realized I was carrying the wrong trail map with me, one that just had an out and back instead of the full loop I had planned. Feeling confident in what trail directions I could remember from studying the map earlier, I stuck to my plan and continued down the valley. Then I missed my first turn. I reached the Jones Mountain Cabin deep within the valley sometime around 5:00. 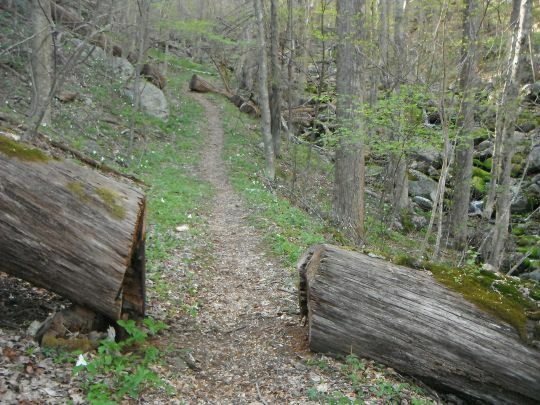 I knew I wasn’t supposed to reach the cabin and remembered it was only about a half a mile back to where I should have turned, so I kept my cool, turned around and kept running. This time I made the right turn and started to climb back up along the Stauntan River. 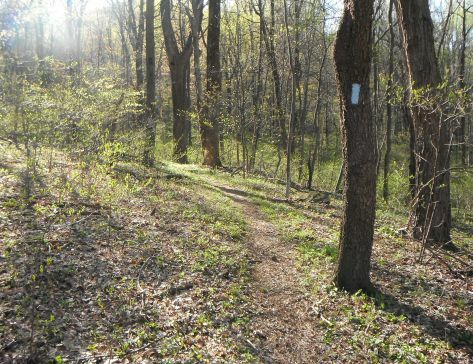 This is beautiful trail, lined with signs of Spring like wild flowers and budding trees. I was on a real roll through this climb, loving the run. But I was also beginning to focus more on the sun, which was now completely on the other side of the ridge and starting to concern me. Really this was probably for the best, as it just put a little more pep in each step. I was running with a little sense of urgency. With the added adrenaline from losing the sun, and a little luck with choosing all the right trail turns, I made it back to the AT with plenty of time to spare. Flying down the last .4 miles of trail back to the car, I felt a great sense of accomplishment, and a real appreciation for the mountains. It was a great way to start my weekend of running. The sun ended up setting with a beautiful display of color around 7:30, well after I returned back to the site. For the next several hours I poured a few beers, grilled a few veggie burgers on the open fire, and lost myself in a book. 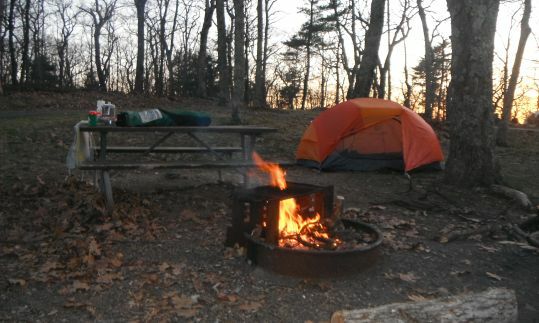 After the flames began to die, I curled up in my down sleeping bag and called it a night. The weekend had just begun, but I already knew this was a successful trip. My mind, body, and soul were feeling refreshed and ready to keep exploring. Look out for Part 2 to come soon, complete with the story behind run #2 and reflections on the weekend.